James’s record shows that he was without a ship between 30 November 1882 and 7 February 1883. Whatever he did in those months, it must have been strange for him to be on land and to sleep in a dry bunk. His next ship was the William Wilson, ON47781, a bark registered at Whitehaven. William Wilson was much smaller than Prince Umberto at 384 tons. So far I have found nothing more about this ship or his journeys on her. He spent 5 months and 27 days aboard, leaving her on 4 August 1883. Another, shorter break ashore and James signed up on the Vinco, a 222 ton vessel rigged as a schooner. This lasted for 10 weeks, and James was ashore again for Christmas 1883. The Voyager and Western Belle must have been more to his liking as he spent five months on the former and eight months on the latter, with another break ashore in between from 13 July and 17 September 1884. He left the Western Belle on 1 May 1885, and took his Mate’s exam on 5 June. There’s a hand-written note on the second page which reads ‘sobriety for the last 7½ months only of the 12 required’ – a story which will probably never be known. 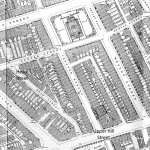 His address is given as Grosvenor House, Spittal, Berwick upon Tweed on his application, but in the space for current address he has entered 13 Upper Stanhope Street, Liverpool – it’s likely he was lodging here while between ships. Curiously he gives his date of birth as 23 June 1863 – one year later than his actual birth date. This could have been a slip of the pen – except he gives the same year on his First Mate’s and Master’s certificates gained several years later. I can think of no reason for this – perhaps he really believed he was a year younger than he actually was? Here’s another thing – his father Robert did exactly the same on his certificates, giving 1826 instead of 1825 as the year of his birth. His first voyage after gaining his mate’s ticket was on Bodelwyddan from 6 August 1885 until 11 May 1886. He signed on as an AB rather than in his newly qualified capacity. Six weeks shore leave, then on 26 June 1886 he joined Argonaut, a much larger vessel comparable to the Prince Umberto where he had spent his apprenticeship. James had almost a year on the Argonaut, next joining Sir Humphrey Davy – after another four months shore leave – as second mate. Christmas 1888 was spent ashore, before he joined Chasca on 28 January 1889. Some of his journeys on the Chasca are recorded on this page. He spent a year in this berth, visiting Sydney, San Francisco and Seattle and working as Second Mate. 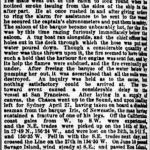 In March 1889, it was reported that Chasca had nearly been lost to fire while at San Francisco. Fire broke out early in the morning of 7 March. Captain Young was ashore, and the steward was first to smell the smoke. The alarm was raised and the fire eventually extinguished with the assistance of a tug and the harbour fire tender, but not before extensive damage estimated at $12,000 had been sustained. Chasca needed a complete replacement set of sails, which caused considerable delay before she was able to leave for Puget Sound for her next cargo of lumber. James did two stints on Chasca totalling just over 11 months. After enjoying two months ashore in January and February 1890 he took his First Mate’s exam. There’s another interesting addendum with these documents – ‘The Captains signature on the discharge of the “Sir Humphrey Davy” 4955 does not agree with the reference’. This does not seems to have had a bearing on the outcome, he sat his exam on 10 March 1890 at Liverpool and passed the colour test, seamanship and navigation parts. Though he was now qualified to serve as First Mate, his next position was as Second Mate on Bankfield. After a year there he had a very short stay on Samanco from 16 to 25 March 1891. 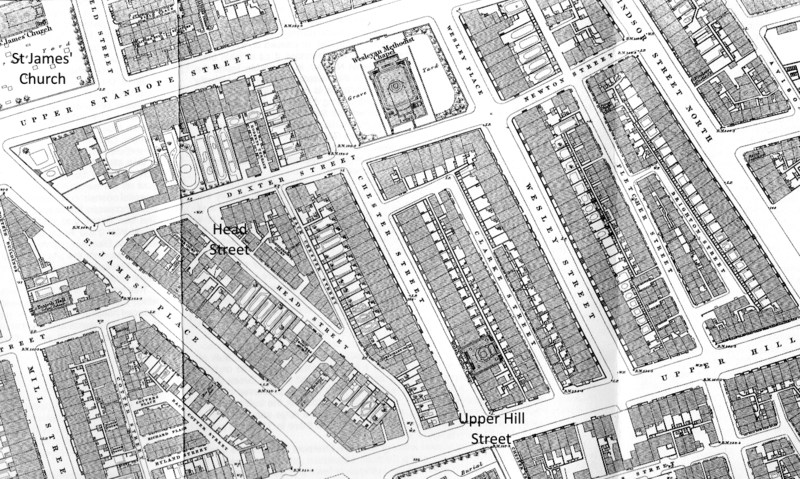 He was at ‘home’ in Spittal for the 1891 census, which was taken on 5 April. Also at Grosvenor House were his now retired father, stepmother Elizabeth Julia (who James referred to as Mrs. Scott), sister Agnes with his nephews George and Robert, and his cousin Agnes G Carr (unsure of her parents). Tending to their needs was 22 year old Mary Johnson, a servant but possibly also a relative – his mother’s maiden name was Johnson. He joined Mary Mark 19 May 1891 and sailed two days later for Belize. At the end of this voyage he passed another Christmas ashore, but this time we know something of his activities – on 21 December he married Margaret Cave, known to him as Maggie. Had he got cold feet and decided to rejoin Mary Mark on her next voyage for Rio de Janeiro, he wouldn’t have got very far – the ship ran aground off the coast of North Wales after several days of dense fog and flat calm. Margaret was the seventh of nine children born to John and Sarah Cave. Her father was Irish, a cabinet maker, and her mother was born in Liverpool. At the census in the previous April, mother father Maggie and her two younger sisters were living just around the corner from Head Street in 36 Upper Hill Street. Her next older sister Sarah had been married the previous year at 19. The wedding took place at St James’s Church at the junction of Upper Parliament Street and Park Road – the church is still standing and now over 240 years old. The address given for both parties was 2 Head Street, less than 100 yards from the church. Witnesses were Robert Crawford Scott and Rachel Boyd. Comparing the signature with other documents, I believe his witness was Robert the brother and not Robert the father. Rachel was Maggie’s 33 year old sister. Once again, James under-reports his actual age – he was 29 at the time of his marriage, not 28! The honeymoon was short, for on 20 January 1892 James returned to the barque he sailed on two years previously, Chasca, this time as Mate. 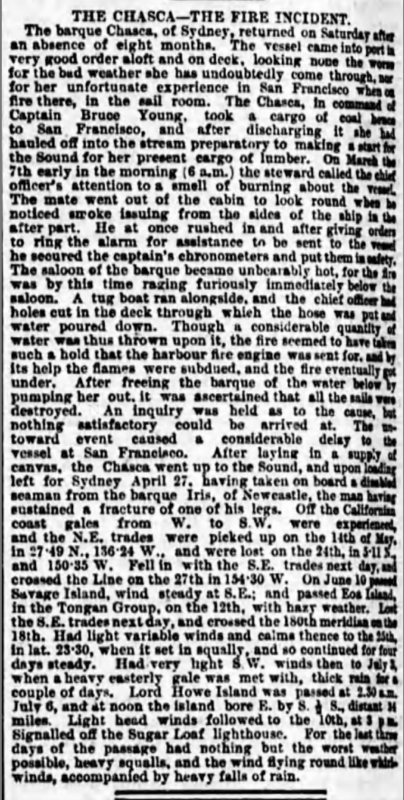 On 12 March 1892 Chasca arrived at Port Blakely (near Seattle) from Shanghai – according to the London and China Telegraph of 26 March 1892. There’s a discrepancy here – if Chasca left Liverpool in January, it had only taken 51 days to circumnavigate the globe. Perhaps there was another Chasca, or the dates are wrong? 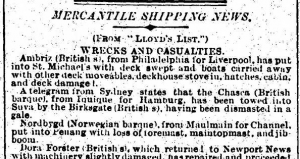 More certain is that she was at Sydney on 1 October 1892, headed for Puget Sound. In early January 1893, there was a report by telegram that Chasca had been dismasted in a gale and was towed in to port at Suva (Fiji). James’ 14 month long second stint on the Chasca ended on 13 March 1893. Once again he narrowly escaped disaster by leaving a ship – Chasca was lost four months later when she ran aground off the coast of Brazil. An enquiry found the Master, David Jones, was guilty of a wrongful default by not taking adequate soundings to determine the depth of the water. His Certificate of Competency was suspended for six months. After returning home on 13 March 1893 James enjoyed almost three months ashore with his bride. His next ship was Prince Rupert, joined on 3 June 1893 just in time for his 31st (officially 30th!) birthday. This was not the ship on which his two older brothers had served their time and of which his father had been Master at the time he was born. Wooden sailing ships did not usually have such a long service life. The new Prince Rupert was ON73699, formerly Ixopo.